Had a HH for a month now and really likin it. Only had a handful of climbs on it. I too am really impressed and suprised how well it switches to Ddrt. It seems to regulate the friction based on the load. I have noticed the dog bone rotate 90degrees sometimes. It happens when load comes off/on and puts a bend in the hitch cord. Anyone else notice this? Maybe the hitch is too long..?? When HH users are doing short ascents (no LOS) are you lifting the HH or the oxan by hand? Generally though very impressed. Paul thanks for sending it to the Aus. Ficus, I think your hitch is too long. I use this 'tending' eye2eye I made to lift the HH and tend it for long ascents. Ficus, I agree with Nick. I use a 5 wrap no braid with 8mm armor prus on imori. I tie, dress, set, and then load it and take a bit more slack out. I haven't noticed the dogbone rotating at all. I'm going to make a short strap like Nick's to tend on long ascents but I've just been putting my hand on the oxan to feed things up. It slides up with no effort at all. Ficus, check that your hitch cord begins its' wraps between your body and the climb line with the HH heat sink side facing you. Or, in other words, the hitch "crosses" on the heat sink side...hope I articulated that. Nick, nice post. I like the ability to run on a weighted line. Is this a first (rope on rope could, of course)? Adam, WHAT UP?!?! Let's climb, man!
" I like the ability to run on a weighted line. Is this a first (rope on rope could, of course)?" Rope on rope can ascend a weighted line, as can mech ascenders. While theoretically with a lot of effort one could most certainly move down the rope with these systems, neither really qualifies to me as 'descent'. Rappel racks, grigri/cinch/ID/rig, rope wrench, ATC, figure eights, munter hitch, wraps on a drum, you name it; all rely on the same thing: Friction based on a bend in the line. None of the descent devices I know of, named or not, can be installed or operated on a taut rope. Being able to use a victims line to descend to their position has some exciting possibilities. Its never been thought of doing that I know of. Big wall climbing hauling your gear you have a progress capture (prussick, mini traxion, shunt, etc) using a HH for that progress capture gives you the ability to lower the load easily and controllable if necessary. 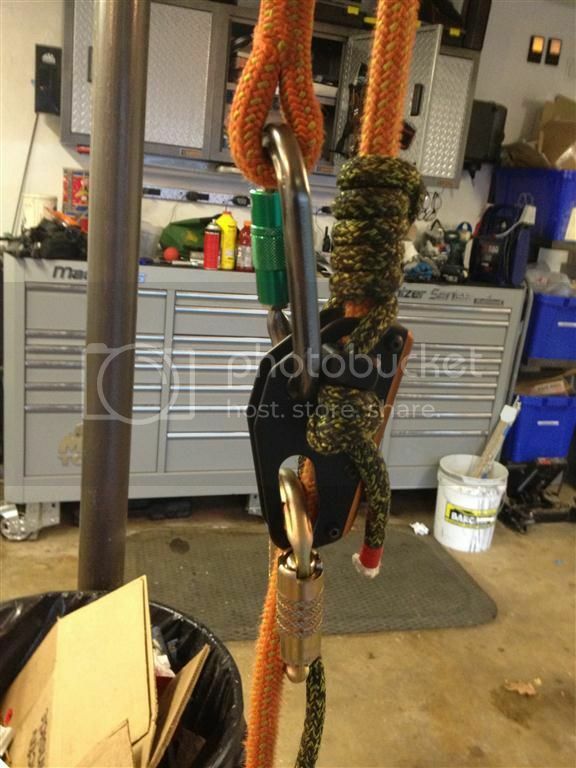 Used as an auto locking belay system in top rope recreational climbing. The perfect link in mechanical advantage systems, it provides releasable single rope progress capture, even at high loads. A lanyard adjuster. It will have all the familiarity of a standard hitch and rope positioning lanyard with all the high tech possibilities of being a self contained functioning SRT or DRT setup. Paired with a thimble prussic or the like it will completely eclipse the functionality of the CELanyard, grillion, DEDA, standard rope lanyard, etc. Trust me, as more people get their hands on these the myriad of applications are really going to become apparent. I can't wait to see what everyone thinks up! My thoughts on the the HH after a week of use are mixed. I love the compactness of it, and I really like the feel of the hitch on descents. But I have yet to figure out a smooth efficient way to ascend, and I don't feel you can tend you rope as easy as you can with a pulley. I'm going to keep playing with it, but right know if I had to choose I'd take the RW. I haven't had the chance to try the HH yet. But, couldn't you use a rope walker or frog with the HH? And, why couldn't a pulley be used with the HH? I guess these questions are for Nick. Hey Nick, how-about posting a vid of your use and tips and tricks with the HH ... or anyone? I hear you've been using the HH for a couple of months. C'mon, my friend ... let us SEE! Search YT for "Rope Wrench" and you get PAGES of hits. Search YT for "Hitch Hiker" and you get about two hits and BUNCH of crap. Ive been using it in a frog walker set up, the problem I'm having is you have to connect what ever your using to advance it to the steal binner, and when I do that I keep having the binner rotate on me, then becoming side loaded. I will get a video up soon. I have been waiting for the official release, as well as getting familiar with it. I dont think you need a pulley to tend the HH, the oxan works fine IMHO. All of the frog/rope walkers I have tried work great with the HH. I have been meaning to try Daves tethered system which shows a lot of promise. Thanks Nick, I'll give that a try Monday it looks like it could solve my problem. I just fashioned the eyes out of tape... tape, fold the eye and tape some more. Like a ghetto grizzly splice. My thinking is that it will break if ever loaded heavily. I like to keep my chest harness tight to it so it tends right away, if I ever fell dynamically or got hit by hit something I am not sure I would want to be 5000lbs attached to it with my chest harness if that makes sense. I also think stiffening it with tape is a good idea so it's easy to clip into . So far its holding up great considering it isn't sewn or anything. Good luck and remember pics or it didn't happen! I think a tether made from a short bight of throwline to a snap might be easiest to install...girth the throwline on one side, then snap to the other. Something like that. The short tether isn't overly difficult to install, just a bit of a trick. I think it's easiest to install the steel biner through the HH alone, then rotate the biner and snap the climbing rope in last (which sets up the slack tending fairlead properly). Initial reaction is that sounds like a good idea. I'd like it if they made the clip-in hole on both pieces of hardware accommodate a snap, as I generally use a steel-core flipline lanyard which has a snap. When using the over the shoulder lanyard tending technique, it would be useful. Nunchuck skillz, computer hacking skillz, MS paint art skillz...Skillz! You guys need to use the HH as is for awhile before changing things. Release has to start with the carabiner and anything that does not account for that will cause problems. Dave, I'm talking about just DRT. I totally know what you mean in SRT. When you said I'd see when I got it that the lower biner has to disengage first you weren't kidding! Nick's tether on the oxan is perfect for that. I'll take a pic later today of what I'm trying to say about DRT. Basically the same as a hitch climber pulley how the working end is clipped into the top hole. This is sort of an example of what I mean. Just imagine that upper biner was in its own hole rather than pushing the dogbone against the rope. On a tether in drt it would be nice too. Something along the lines of a hitch climber hiker. I do realize that the HH is primarily used for SRT (and also that this is the SRT forum) but I think the double duty aspect of the thing kicks a$$. Having one more hole for drt would make it perfect for me.